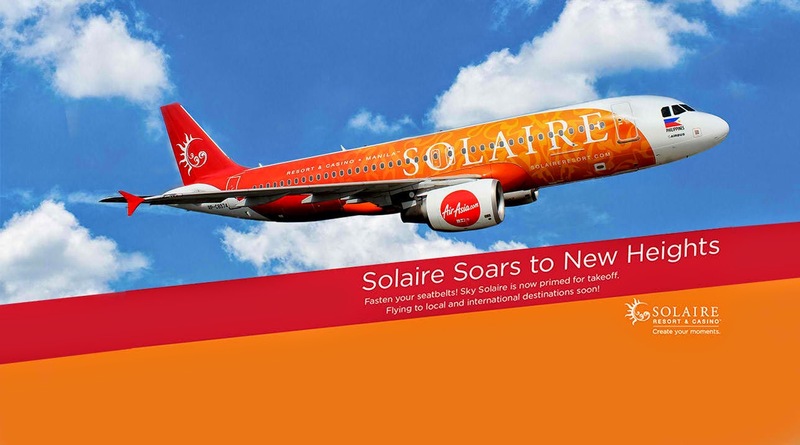 Aviation Updates Philippines - Solaire Resort and Casino with the partnership of AirAsia Philippines, unveiled its new Airbus A320-200 livery. Solaire is the first brand in the country to brand a commercial airline, in order to promote tourism in the Philippines and in Asia. The Airbus A320 of Solaire/AirAsia, also known as Sky Solaire, will soar the skies in July to let customers experience a modern air travel and leisure experience. It will also facilitate more passenger and cargo volume in international and domestic flights. "This milestone is a key undertaking between two passionate brands with entrepreneurial and dynamic mindsets. This unprecedented branding project in the Philippines may be taken as a leadership statement which attests to Solaire's strong growth momentum in the industry. Yes we are again raising the bar; this time we're taking it to the skies," Solaire Resort and Casino board director Donato Almeda said. Currently, Solaire's livery can only be seen in one Airbus A320, which is RP-C8974. But, nothing is stopping them from further rolling out this innovative wrap on additional aircraft in the future with broader partnership arrangements. "This new livery demonstrates our creative approach to partnerships and marketing opportunities especially with companies that support our vision to grow tourism," AirAsia Philippines Chief Executive Officer Maan Hontiveros said. With Solaire's "Create Your Moments" campaign, which highlights Solaire as the best place to create wonderful memories, in partnership with AirAsia will harmoniously evoke the key thrusts of customer service, hospitality, and excitement for both their industries. "AirAsia Philippines is a sociable and innovative brand," AirAsia Philippines chairman Maan Hontiveros said. "We also take pride in our collaborative nature. This new livery demonstrates our creative approach to partnerships and marketing opportunities especially with companies that support our vision to grow tourism. We are thrilled to carry Solaire's brand in the sky and on the ground at the airports here and abroad, extending to as far as our destinations in Malaysia, China and Korea." Hontiveros added. Meanwhile, PHAR managing director Nick Lockwood explains that customers greatly respond to brands they experience while they are on the move. "With our expertise we help match brands that have aligned business goals to deliver innovative and mutually beneficial partnerships. We look forward to supporting AirAsia Philippines and Solaire Resort & Casino in this exciting long term initiative which will see exciting thrills offered by both AirAsia and Solaire," Lockwood said. The Airbus A320-200 was unveiled on June 25 to promote one-year old Solaire and AirAsia Philippines' domestic and international flights. In 2013, AirAsia signed a strategic alliance with local airline Zest Air to create AirAsia Zest, now rebranded to AirAsia Philippines.